On the final 205 Live before WWE Royal Rumble, Kalisto, Akira Tozawa, and Hideo Itami battle it out in triple threat competition. With all involved in a Fatal 4 Way match this Sunday, against Buddy Murphy for the Cruiserweight Championship, these three challengers will endeavor to give fans a taster for what could be in store in Phoenix, Arizona, in five days. 205 Live General Manager, Drake Maverick, starts the show with his signature introduction hype video, detailing Tozawa, Kalisto, and Itami’s journey heading into the Royal Rumble title match. But before the main event, Gran Metalik will take on the newly acquired Humberto Carillo in singles action. As announced on the 205 Live Twitter account earlier today, Aiden English joins the commentary team. Although I’m unsure of the permanent line-up for the booth, English joins Vic Joseph and Nigel McGuinness this week, with Percy Watson off the team for the time being. A show of respect is proffered by Carillo in the form of a handshake, which Metalik accepts. More locked hands continue as the match gets underway in the form of crisp technical wrestling. This is swiftly followed up with identical offense being countered with equally twinned counters and dodges, the WWE Universe voicing their appreciation as a stalemate is eventually reached. The King of the Ropes is undoubtedly the more experienced wrestler, however, Carillo is trying his utmost to show he belongs in a ring with a 205 Live stalwart. His speed surprises Metalik enough for the Lucha House Party member to be thrown out to the floor under the bottom rope. Carillo follows Metalik out with a Fosbury Flop over the top. Carillo has come out of the gate in a higher gear than his counterpart, so far. Metalik has been in the game a lot longer though. Back in the ring, Metalik manages to block an airborne Carillo with high boots, who spills to the mat holding his face. Metalik earns the first pin attempt after a reverse slingblade. Not known for the slower paced grounding down of his opponents, Metalik has had to adapt his style in dealing with the eager Carillo. A rear chin lock wears Carillo down, but he fights out of it. He desperately wants to avoid starting his 205 Live career with two consecutive losses. His offense becomes more brutal as a result, as he jumps from the top turnbuckle and slams Metalik’s face onto the apron. A short while after, Carillo finds himself on the apron again. Metalik, back in the ring, lives up to his moniker, as he vaults the top rope and throws Carillo to the floor with a hurricanrana. He shoves Carillo back into the ring and looks for a pin after a springboard senton variant, but to no avail. Metalik now has Carillo poised for a superplex, but Carillo hooks Metalik’s foot. He kicks Metalik off and away from him, and aims a successful missile dropkick into Metalik’s chest. Metalik is launched to the opposite corner of the ring. Carillo follows Metalik. In what seems to be Carillo’s finishing move, he performs an assisted headstand on the turnbuckle, pumps himself upwards and twists, with his legs landing on the top rope and flipping him up and over onto Metalik. Carillo goes for the cover and earns the victory. Metalik congratulates Carillo after the match and raises his hand. An impressive scalp for Carillo in this exhibition match. He displayed a sense of urgency that was missing in his frankly awkward and lackluster match against Buddy Murphy last week. Perhaps Carillo’s move to 205 Live was an inspired choice after all, as a more spirited offense like this will put him in good stead going forward. Drake Maverick is backstage, waxing lyrical about Carillo’s performance to… none other than… Drew Gulak and Jack Gallagher. Understandably, Gulak is incensed at the aerial offense in which Carillo was most comfortable exerting. Gulak storms off in a rage and Gulak follows, however not before giving Maverick a “do you even realize who you were talking to? !” look. Tony Nese approaches Maverick now. Nese wants a rematch with Noam Dar right now. Maverick understands a rubber match would be a good idea. He says he will consider it, but Nese says he should do more than consider it. He’s sick and tired of hearing Dar talk trash. If Maverick doesn’t do what Nese wants, he’ll take matters into his own hands. Tozawa and Kalisto are in separate backstage areas, accompanied by Brian Kendrick and Lince Dorado respectively. Both outfits give their take on tonight’s match and how it will be an indicator of what will happen at the Royal Rumble. No input from Itami (or Ariya Daivari) yet. Kalisto makes his way out first with Penelope the Pinata. Nigel McGuinness pokes fun at Kalisto and his mascot, whom he calls a “cardboard donkey”. That quip alone, and not the fantastic story of his career recently added to the WWE Network, is what makes Nigel McGuinness a national treasure. As Tozawa’s music plays, Itami and Daivari offer Kayla Braxton a similar promise of success to those of Tozawa and Kalisto earlier, before heading out last to the ring. It should be noted that all three competitors do not have their companions accompanying them at ringside. Before the match gets officially underway, Buddy Murhpy’s music plays. He comes out in normal clothes (well, a Buddy Murphy top, probably available at WWEShop.com), and he joins English, McGuinness, and Joseph. It appears he is there purely as an observer of his three opponents on Sunday however, and not to add a voice to the analysis. I had a lengthy back and forth with some readers of this column in last week’s comments section in relation to Murphy’s microphone skills. It’s a shame that Murphy can’t continue to add to his experience in the form of commentating on his upcoming competition. The bell has now rung, and Itami takes advantage of the distraction by laying an unsuspecting Tozawa and Kalisto out. He throws Tozawa out through the ropes and focuses on Kalisto. Kalisto is ready for Itami however, his athleticism and scrappy aggression on point early on as he sends Itami out to the floor. Kalisto turns back round to look for Tozawa, but he doesn’t have to search for long, as a missile dropkick crashes into him. Kalisto joins Itami on the outside, and Tozawa takes out both men with a suicida headbutt. The commentary table shakes from the impact. The match is quite literally off to a flying start. I’m all for story driven wrestling on 205 Live, but the Cruiserweight Division lives up to its namesake in these multi-man matches. Itami has Tozawa back in the ring and on the mat. He lays in heavy stomps before heading back out to deal with Kalisto. Itami continues his destructive ways with a brutal forearm to Kalisto’s head. Itami stares daggers into Murphy, who looks on, impressed. The Japanese Legend returns to the ring, but his compatriot is ready to fight back. Tozawa catches Itami with a backdrop driver, and fells the incoming Kalisto, with a high dropkick. Tozawa is laid out however by a temporarily revived Itami. All three are sprawled out on the mat. All three then gingerly make their way to their feet, all the while smashing each other with interchanging strikes and kicks. Tozawa wins the mini-battle as Murphy applauds the sequence. Tozawa takes his eyes off the prize, however. Itami climbs the ropes with Tozawa’s head in his grip, and swings over the rope with a guillotine to Tozawa’s throat. Itami is still poised on the ropes as Kalisto corners him with a superplex in mind. Unable to move him, Tozawa joins Kalisto, looking to double the pressure. Again, Itami is immobile. All of a sudden, Murphy enters the ring and Tozawa and Kalisto, who in turn finally superplex Itami. The “tower of doom” sequence is all legal, as a multi-man match has no disqualifications. The referee is still angry though. He tries to get Murphy to leave the ring, but the Cruiserweight Champion swaggers around the ring, picking the bones of his challengers. He poses for the hard camera as Tozawa, Itami, and Kalisto all suffer the effects of Murphy’s beat down. Kalisto and Tozawa eventually take advantage of Murphy’s back being turned and team up to get revenge on Murphy. Itami shortly rejoins the action. The match quickly becomes a frantic affair. Signature moves from each challenger are delivered with haste. Tozawa and Kalisto exchange blows upon the top rope. Kalisto goes for a hurricanrana, but he meets the mat alone as Tozawa has locked his grip on the ropes. Tozawa looks to capitalize with a top rope senton, but Kalisto rolls into the corner and away from immediate danger. Itami leaps over Tozawa and destroys Kalisto with a hesitation dropkick. He moves over to Tozawa and floors him with a twisting knee strike. He covers Tozawa for the one, two, three. Itami is joined in the ring by Ariya Daivari as they celebrate. An embarrassed Murphy looks on from the ramp, as Kalisto and Tozawa are out for the count. While all three wrestlers put on valiant efforts, Itami looked the strongest out of them all. More calculating. More opportunistic. More deadly. These are great attributes to have heading into the Cruiserweight Championship match at Royal Rumble. If Murphy scrapes a victory, I would be intrigued to see if Itami is the one to run a program with the Juggernaut heading into Wrestlemania. Tonight was a good indicator of what could be in store this Sunday. The action was relentless for the majority and displayed each wrestler’s strength in spades. 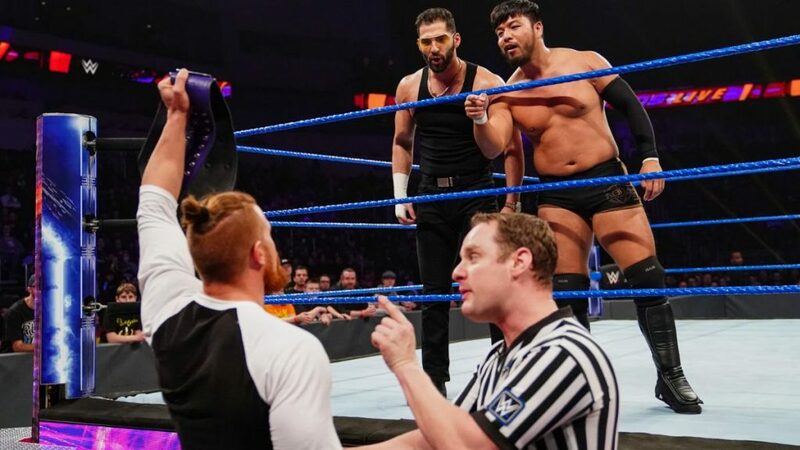 With the move of 205 Live back to Tuesday nights, and being filmed after Smackdown Live, this outing was evidence that the roster will go that extra mile in retaining the good 205 Live amounted towards the end of 2018. Check out the latest podcast of “The Ricky & Clive Wrestling Show“. Ricky & Clive return this week with a packed episode, previewing one of the biggest events of the WWE calendar: Royal Rumble Weekend! With NXT Takeover: Phoenix the night before, it looks like a very solid weekend of wrestling could be in store. We cover both nights with a discussion on the build leading into both matches, while our predictions league makes a return! We finish with a “Royal Rumble” themed quiz.